Berlin-based app builder, AppYourself, was founded in 2011 in order to help people create ‘high-quality business apps at fair prices’. Ecommerce definitely seems to be the focus with this app maker, and is one of the highlights of the platform. AppYourself offers small businesses a few options to display their wares in-app, whilst also allowing purchases to be made directly from within the app itself via direct credit or PayPal. If you already have an online shop on one of the bigger platforms, such as Shopify, then it may disappoint you to find out that there is no integration for these. 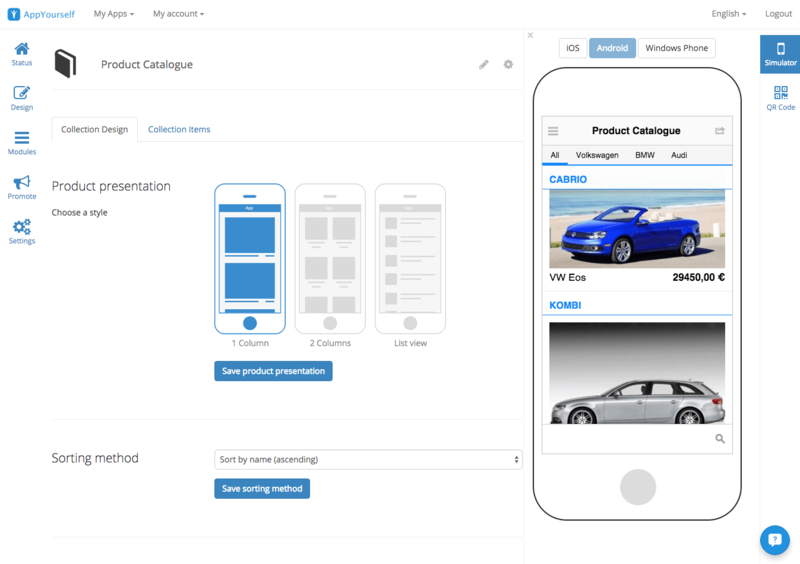 But if you’re happy to build up your own catalogue of products within the app builder, then AppYourself offer the advantage of keeping your customers within the same environment, instead of sending them externally to complete their purchases. 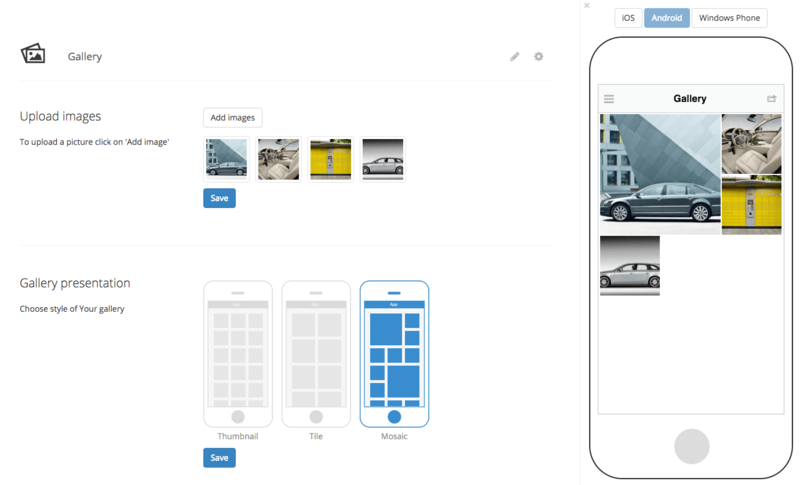 A new addition to the app maker involves not only creating a web version of your app, but also a desktop website. This is more useful, as web apps can often look clunky on full-size desktop screens. It's auto-generated from your content, so not very flexible, but you can decide which features are visible and it still looks decent. Progressive Web App with push notifications. 200 active users a month. Same as above but with 2000 active users. The Android and iOS native app plan. Unlimited active users. AppYourself has some good options for app makers who want to have a complete in-app store. Even though there isn’t specific integration for services such as Shopify, you can create a catalogue, or shop, that allows customers to purchase and pay without ever leaving your app. The editor is well-designed and user friendly. 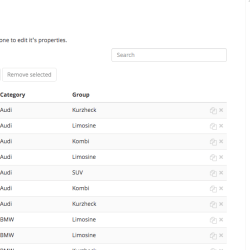 The menus make sense and it’s very easy to add modules and choose layout options. The simulator is also done well, loading quickly and giving you the benefit of swapping easily between operating systems. 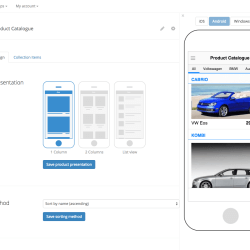 This is one of AppYourself’s weak points due to the lack of customisation options and templates, leaving final products looking a little cheap and dated. It’s nice to see that they do have different layout options for separate modules though. Apart from a few initial sign-up, and language, difficulties, this app maker is easy to use. 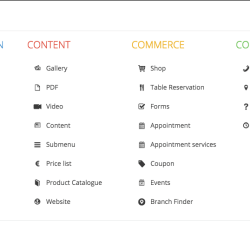 The menu layout within the editor is user-friendly and it’s simple to add modules and choose layouts for each section. 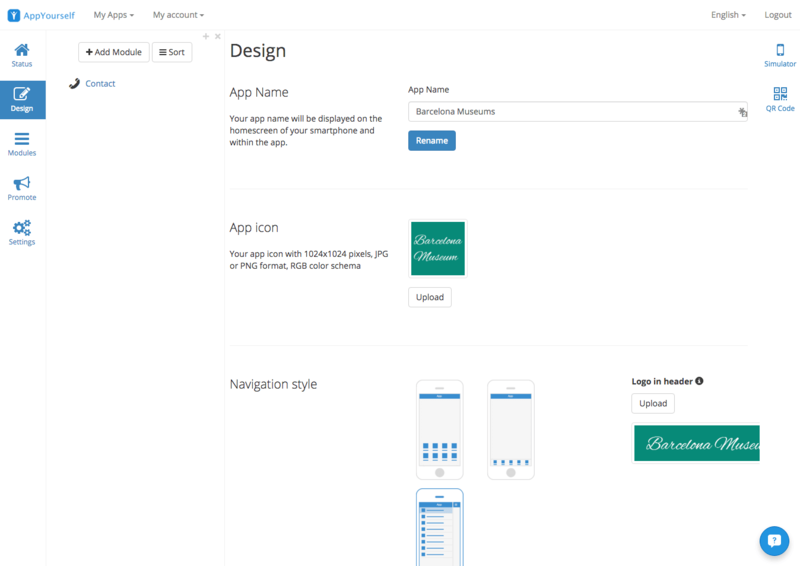 AppYourself don’t really offer a choice of templates, just some very basic design elements. They do pick up some points for having different layout options for most modules, and I particularly like that most modules come with sample data to give you an idea of how a section looks and feels. But it’s still a feat to create a modern-looking app. Now available in 8 languages: English, German, Spanish, Italian, Swedish, Turkish, Portuguese (PT) and Portuguese (BR), yet there are a few translation issues within the site. They do pick up extra points, though, by making it relatively easy to create a multilingual app without publishing one app for each language. AppYourself now focuses on Progressive Web Apps for its two entry plans. 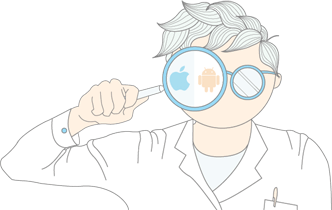 If you want an iOS or Android app, you’ll have to go for the more expensive Enterprise Plan. Ad support is not available. Unlimited notifications available on ‘Basic’, ‘Premium’ and ‘Professional’ plans. A nice touch is you can send them to selected users only or all of them. While there is a basic map module, there are no location-based services available. Ecommerce is done well with AppYourself. There are several options for displaying your items: a ‘Catalogue’, ‘Price List’ or ‘Shop’ module. The latter allows customers to buy things directly within the app via several payment methods. 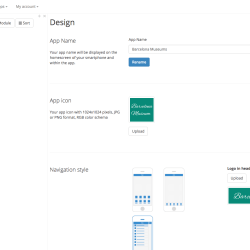 If you’re after specific online-shopping integration, such as Shopify, though, then you might want to try another app builder. This is available via both a dedicated RSS feed module and a ‘News’ module. You can add your own source code within the ‘Content’ module, but there is no dedicated HTML module available. AppYourself have the bare bones of social media integration, with Facebook and Twitter modules. There is an option within the settings to allow for in-app sharing for users too, which might be useful for some small businesses. The new chat feature is also a nice plus for speaking with your customers live. You can add up to ten coupons within the ‘Coupon’ module. 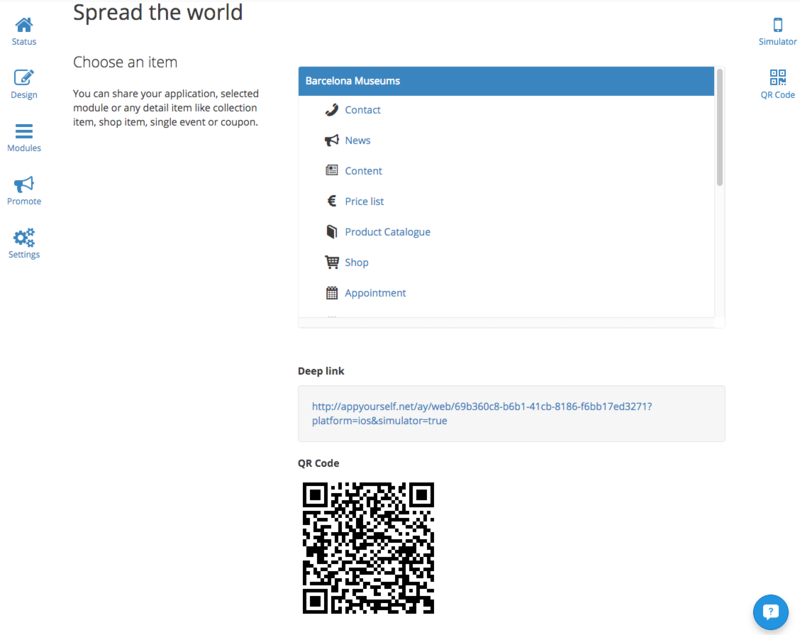 There is also now the stamp card module available and a PIN system for loyalty features. Full API access is available on request, without any extra costs, for ‘Premium’ and ‘Business’ customers. There is a downloadable app previewer, AppYourself Connect, available for both iOS and Android. 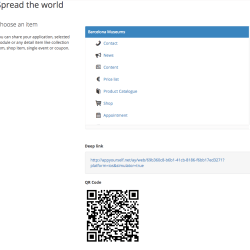 You can also use a QR code to test a web version of your app. Additional to being just a previewer, you can also directly send push notifications, create coupons and receive messages through Connect. You have both AppYourself’s custom analytics, as well as Google Analytics, available on all plans. They also offer App Market Cockpit, which is a broad statistics overview. Support options consist of a knowledge base, email support and online chat. The knowledge base answers include only the bare minimum, and there are no tutorials that I could see. The email support is fast and brief, but they were also fast with any follow up questions I had. 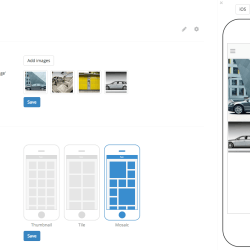 It’s quite easy to use this app maker, free of frustration, yet the lack of colour and design within the editor itself can make the experience a little dull after spending a few hours working on your app. If you’re trying to sell things, or charging for your app, you really do need it to look slick and professional. This may not be possible with AppYourself’s lack of design options. If, though, you’re after a basic app for your restaurant, or appointment-based business, then the mid-tier pricing option isn’t bad value. 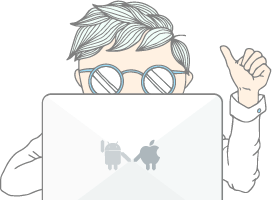 AppYourself have a clean platform, and one that is relatively user-friendly for beginners to app-making. It could be especially useful for small businesses who are starting out and need a platform to get their head around the basics of transforming their online presence into a mobile one. It has a good selection of ecommerce modules and useful sample data within these to help you see exactly how it might look once you fill it up with your own products. The live chat is also useful if you need to get in touch with customers directly. Unfortunately design is not one of AppYourself’s strong points. Whilst there are apparently many category-based templates to choose from, they only seem to be accessible via their ‘Wizard’ process, and, only then, if you choose a Facebook page or a Google place for your business. I couldn’t find any template choices, though, after struggling my way through this path due to not having a Facebook page or Google place I wanted to use. The main difficulty I found with this app builder, though, is within their mission statement. AppYourself want to help businesses create high-quality apps at fair prices. Whilst the prices are not unreasonable, I really think most people will struggle to create a great-looking app on this platform due to the lack of design options and flexibility within the builder. And the truth is, with app stores such as Google Play having well over a million apps available, unless yours stands out from the crowd it’s unlikely to get any downloads. Sadly, all the apps I’ve seen designed within this platform lack the professional look and feel I’ve seen from others. 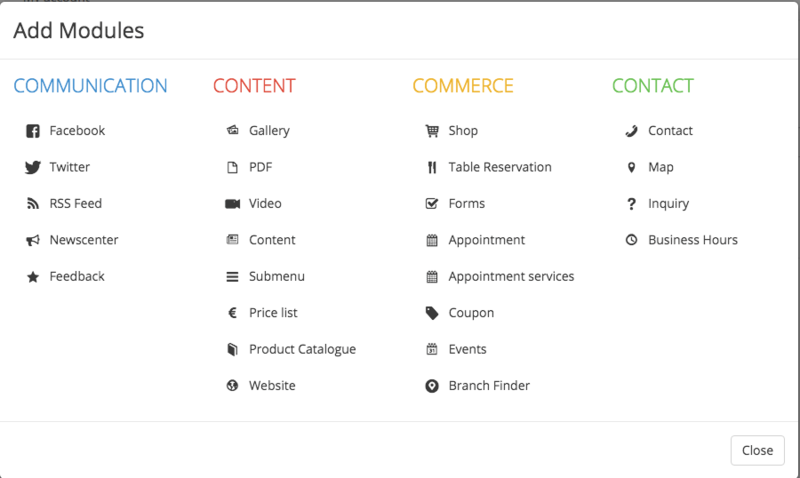 If AppYourself focus squarely on getting their design options updated, then the platform would be a much better choice. It’s easy enough to upgrade with AppYourself, and you can do it before the next pay cycle. Unfortunately, though, they do not offer downgrading as an option. Yes, you just need to email support with your cancel request. There are no charges associated with this.